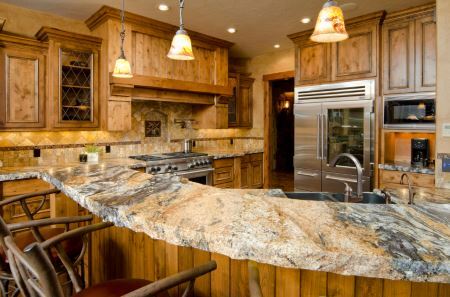 Most buyers are not aware of the basics of Granite Selection. But it is an absolute necessity to know these things before you hand out a check to make a purchase. In the absence of an industry-wide grading system that reflects the quality uniformly, retailers use an in-house grading system to group granite slabs. Slabs with excessive soft minerals that are more prone to damage are considered low grade. These may also be called second choice or industrial grade by some suppliers. Slabs that offer clear colours with colourful patterns (not exotic colours) are grouped into the mid-grade. Exotic Granite with beautiful colour patterns are labelled as high grade. The country of Origin can be a huge determining factor for the quality and the price. China is considered to be the largest exporter of Granite at extremely competitive rates because of low labour costs. As a rule of thumb, experts suggest that Granite from Italy, India and Brazil are considered to be high quality stones. Some colours of Granite are considered to be more durable than others. Reds and browns for example, tend to be more difficult to cut as compared to white granite, which is softer. However, if you spend some time in the upkeep and maintain the granite regularly, then it will last long irrespective of its colour. The colour should only be used as a matter of personal choice for aesthetic purposes. Since granite is quarried out in the form of huge slabs which is then shipped to various locations, some suppliers cut thinner slabs out of the huge chunk. For use in your kitchen in Toronto, look for Granite that is at least 1 ¼ inch thick. Anything lesser than 1 inch may not be thick enough for use in the kitchen as a countertop. Last but not the least, Granite can be fabricated both by hands and by machine. Machine fabrication is faster but lacks the finesse that comes from skilled craftsmen. As a result, machine fabricated granite may be less expensive as compared to manually fabricated ones. The drawback of machine fabrication is that it does not polish the edges as well as craftsmen do by hand. Some suppliers use wax on the edges to conceal this. But wax will wear off after a while. So, while buying granite, ask the supplier if it is fabricated by hand or machine. Also ask them to mention in the contract if they use wax. Always remember that when it comes to buying granite countertops, there is always more than what meets the eye. So be choosy while meeting suppliers and fabricators and choose the exact slab that you want installed in your home in Toronto.